One of the most impressive meals i have had in Tokyo in 2016 was at an 'old' new restaurant in Tokyo called CHIUnE. The reason i said 'old' because it was actually relocated from Gifu, its previous incarnation is the best French restaurant in Gifu - Satoshi.F. In case you are still kind of lost, then you might heard about the legendary Chinese restaurant Furuta (at least from my previous post :D ). Satoshi Furuta, the chef-owner of Satoshi.F and CHIUnE, is the son of the chef Furuta. 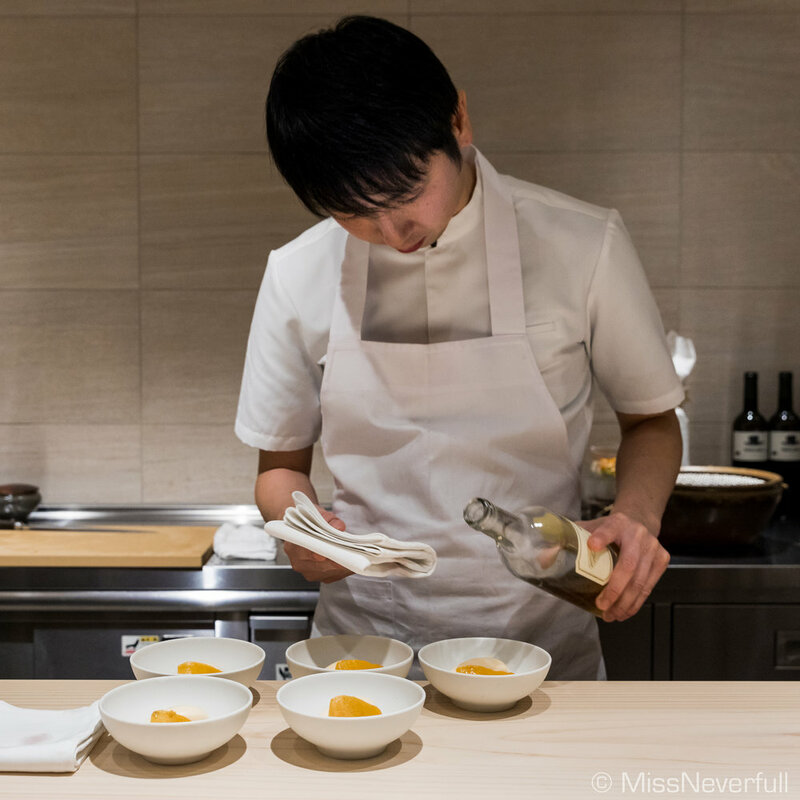 Father's unique philosophy and extreme passionate in cooking play an uplifting influence on Satoshi, which made his remarkable success in the Japanese dining scene. Throw back to the old days in Gifu, where the Furuta family rises with the famous Chinese restaurant Kaiketei. Father Furuta runs Kaiketei until he moved to Tokyo to open Furuta, his older son is now taking care of Kaiketei, while the younger son Satoshi runs his 4-seat French restaurant in Gifu. 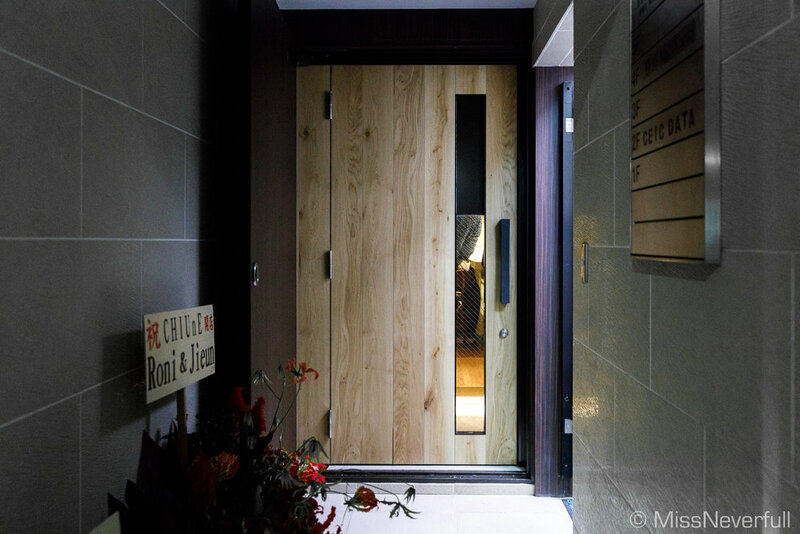 With the opening of CHIUnE on December 28th, 2016 in Ginza area, Satoshi not only reunions with his father again (just a one-minute walk from the 'father restaurant' Furuta), but also brings his authentic cooking to Tokyo. Hooray! At CHIUnE, Chef Satoshi Furuta serves a fixed menu priced at 25,000 Yen which includes 10-13 dishes changed on a daily base. Wine pairing or semi wine pairings are also available. A creamy and umami soup to awaken our taste buds. Made of grilled Tora-fugu's shirako from Mikawa-wan blended with dashi of Bon Dabon Ham, a premium ham producer in Gifu, also the only certificated ham producer in Japan. The caviar luxuriously gives a umami boost to the delicious soup. A very impressive starter. The meal continuted with another strong dish of horsehair crabfrom Uchiura-wan with vermicelli. Taken the heritage of father Furuta, vermicelli is a fixed routine at Furuta-family's restaruants, include Kaiketei, Furuta, the previous Satoshi.F and of course, the new-born CHIUnE. Compare to the simple vermicelli with only chives and white pepper we had at Furuta early this month, this is no doubt a more nourishing version matched with incredibly umami crab. The al dante vermicelli was quite sync with the moist and juicy textures of the crab too. Followed by a warm, healing bowl of pure consommé of PÄRSÙT ham, also from BON DABON, topped with Alba white truffle. The soup itself was mind-blowing, 'liquid gold' it the only word in my mind. 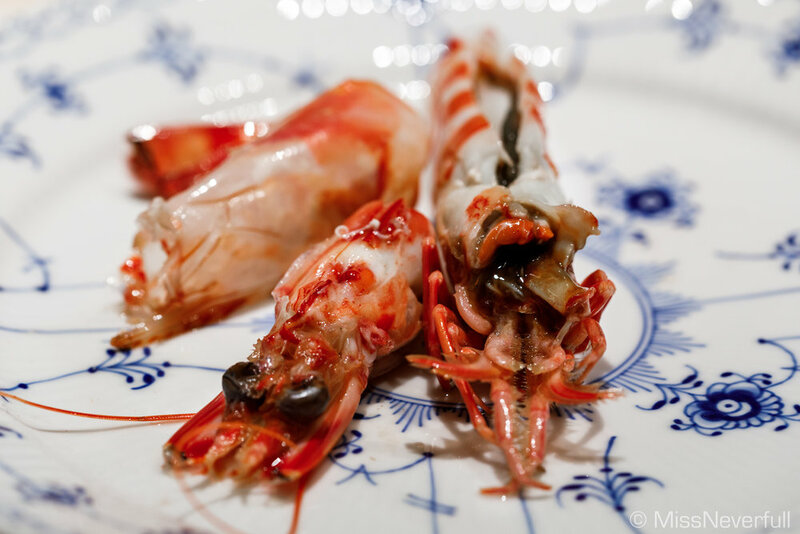 For most of the times, Kuruma-ebi (Japanese jumbo prawn) is served in Japanese restaurants. This was actually my first time having such a big prawn ((even longer than my palm) in a western restaurant. And more surprisingly, it was slow-cooked with the simplest technique, and served without any seasonings. Besides the amazingly tender and fragrant prawn body, the large portion of ebi-miso in its head was irresistible. 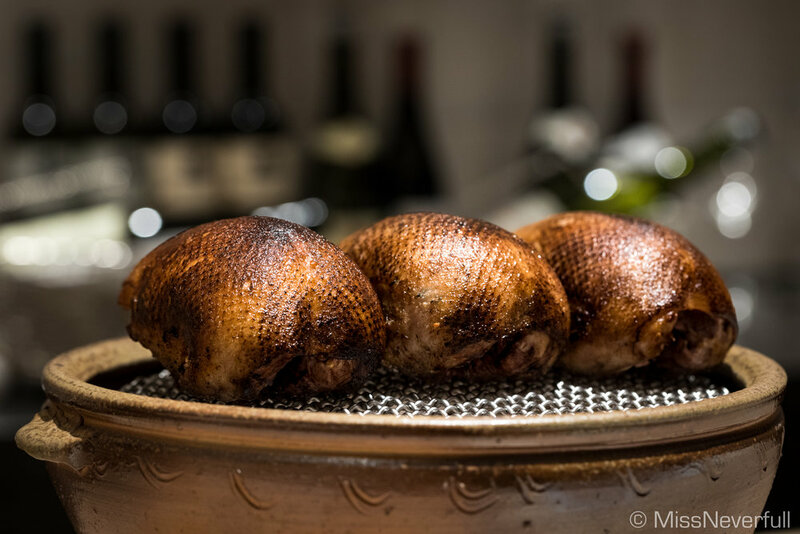 At the very beginning of the meal, Chef Satoshi-san showed us the Mallard duck from Gifu to be cooked for our first main course. It was roasted then smoked for almost an hour in totall. Isn't it looks mouth-watering? On a bed of the truffle & duck jus and nameko mushroom purée was incredibly succulent duck meat seasoned with only a pinch of salt, its crispy skin was unforgettable. 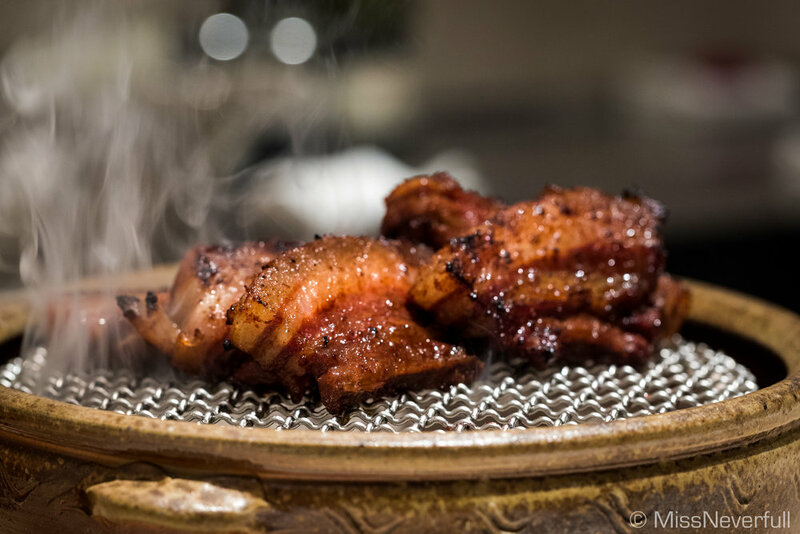 The last main dish to arrived was grilled wild boar belly (from Ibigawa, Gifu), marinated for two weeks and wonderfully roasted with Yonashi (Japanese pear) sauce. Arguably the best piece of boar in life. I normally don't eat boar (not even pork) especially the fat, but this one was extraordinary. Even the fat was so ridiculously delicious, chewy and a bit crispy on the outside. I don't mind to have a second piece if there was more left. A healing, warm bowl of good carb is everything I need in this cold winter in Tokyo. This reminds me of 3* Ca Sento in Kobe where also serves a lovely pot of rice congee before the dessert to arrive. By using the grains from Gero (下呂) in Gifu, the creamy congee was deliciously unforgetable with the bouncy abalone, the abalone liver sauce was amazing too. I was craving for a third bowl but sadly, all six guests at the counter including me have had two bowls, and the whole pot was empty already. Shaoxing wine ice-cream was another classical one from Satoshi.F. It is seriously something new to me, a pure Chinese. 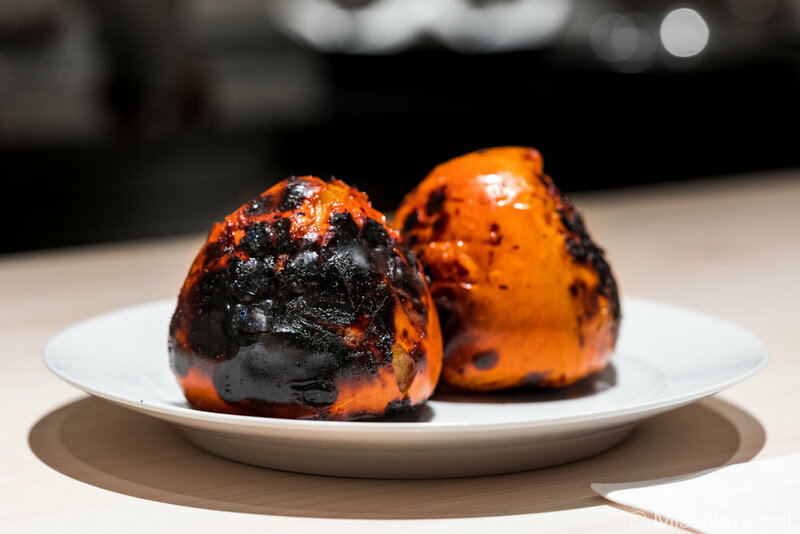 The ice cream was so gracefully matched with the grilled persimmon. As an soft-opening special, Satoshi-san also added some Premier Cru Supérieur Château d'Yquem 1985 into the dessert. Divine! This was my last meal in Tokyo in 2016, also the last restaurant i visited. It was nothing but fabulous. Even at the top-ranking Western restaurants in Japan, most ingredients are not as premium as Japanese cuisines. However, you don't have to worry about ingredients at CHIUnE. And what else i particularly like about this place is the cooking techniques, every dish was so simply seasoned but the tastes was amazing. With Satoshi's great potentialities in cooking, I am quite confident that CHIUnE will soon become one of the best restaurants in Tokyo.